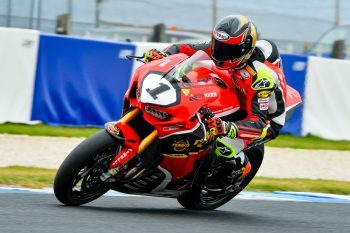 Reigning champion Troy Herfoss has declared he’ll definitely be competitive for this weekend’s second round of the 2019 Motul Pirelli Australian Superbike Championship (ASBK) after an uncharacteristic sixth at Phillip Island’s season-opener. Herfoss took on double duties at the Island, challenging in the ASBK as well as capitalising on a wildcard opportunity in the FIM Motul Superbike World Championship (WorldSBK), which ultimately resulted in a difficult weekend. Round two’s stop at Wakefield Park in New South Wales has been a strong venue for Herfoss, capturing victory their for the past three years. Following testing at the Goulburn circuit, the town where Herfoss grew up, he believes he’s in an even stronger position than this time last year where he rode commandingly. “It’s exciting to get the regular season started, in which we can focus on the one class and – as they say – we’re the ‘big show’ from now,” Herfoss stated. “The sessions go back to normal, in comparison with Phillip Island’s opening round, so I’m looking forward to getting on track. “We’ve learned a lot since round one and that’s the most important thing, to keep progressing as the year goes on.The tests we did at Wakefield Park were positive and we were happy with how they went, so I’d say we will definitely be competitive and even more so than we were at this time last year. The championship is currently led by Yamaha privateer Aiden Wagner, followed by Cru Halliday (Yamaha Racing Team) and Josh Waters (Team Suzuki Ecstar Australia). Herfoss sits 30 points behind Wagner.